Army Officer Jacquelyn Messenger is part of the first class of UTSA doctoral students who will benefit from UTSA’s expanded Cell and Molecular Biology PhD program. (Feb. 6, 2019) -- At a time when the world's second-deadliest Ebola outbreak has now reached more than 600 confirmed cases, local partners are uniting forces to develop the next generation of infectious disease researchers. Through an agreement with Texas Biomedical Research Institute (Texas Biomed) and the United States Army Institute of Surgical Research (USAISR), doctoral students in the Cellular and Molecular Biology program at The University of Texas at San Antonio will now have access to nearly 20 new research laboratories. “The strength of this program is that it offers students a wide selection of research opportunities,” said Professor John McCarrey, Kleberg Distinguished University Chair in Cellular and Molecular Biology, who is overseeing the expanded Ph.D. program at UTSA. This new collaboration will now offer 19 additional laboratories to UTSA Cell & Molecular Biology doctoral students, essentially doubling their research opportunities. At Texas Biomed, UTSA doctoral students will have a chance to research therapeutics against Ebola and the development of vaccines to block HIV at portals of entry. They may also conduct cutting-edge research into how co-infections interact in pediatric AIDS or apply functional genomics to understand airborne infections such tuberculosis or anthrax. But it is not just the combat against deadly diseases that needs a pipeline of researchers. Close to 53,000 military personnel have been wounded in U.S. military wars since 2001. The USAISR seeks to innovate techniques that will save the lives of U.S. service personnel. Through this new local partnership, UTSA graduate students will have the opportunity to work in USAISR research laboratories on combat casualty care, including new trauma therapies for burn or hemorrhagic injuries sustained by wounded soldiers and advanced cellular therapeutics to fight microbial biofilms responsible for non-healing chronic wounds. 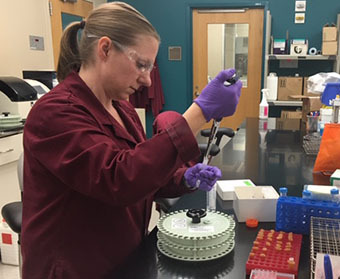 Army Officer Jacquelyn Messenger, who conducts research at the USAISR on platelets to improve blood transfusions on the battle field, is part of the first class of UTSA doctoral students who will benefit from UTSA’s expanded Cell and Molecular Biology PhD program. The UTSA Cell and Molecular Biology doctorate program began in 2004. Conversations about expansion began between UTSA,Texas Biomed and the USAISR about three years ago. Now that state and federal requirements have been cleared, the partnership is in launch mode and UTSA is actively seeking additional new doctoral candidates to reap the benefits of these many new research opportunities. “We hope to at least double our number of graduates. We want our Cell & Molecular Biology PhD program to rival the best in the country,” said McCarrey. Learn more about UTSA’s Cellular and Molecular Biology Program. Learn more about the Texas Biomed adjoint faculty. Learn more about the USAISR adjoint faculty.